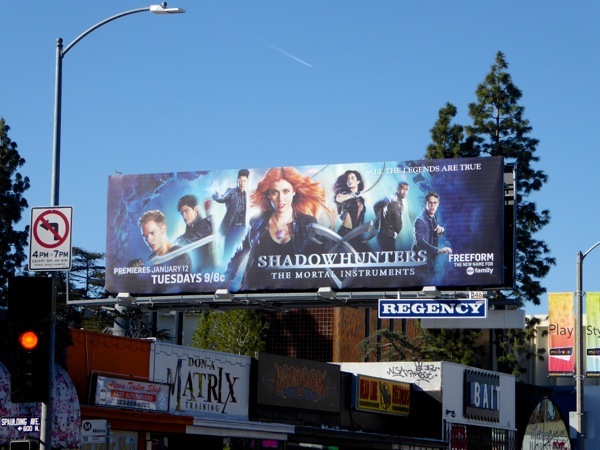 After the 2013 big screen flop, Cassandra Clare's The Mortal Instruments novels are getting a second lease on life with a small screen adaptation on Freeform (the new name for ABC Family), called Shadowhunters. Katherine McNamara stars as the heroine 'Clary Fray' in the new episodic fantasy series, where she learns that she is a Shadowhunter, a human-angel hybrid that hunts demons. 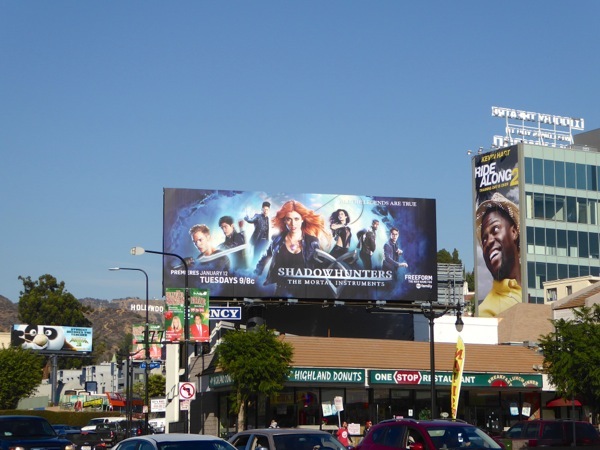 When her mother is abducted by a demon, Clary joins forces with a group of Shadowhunters and unlocks powers she never knew she had to save her. 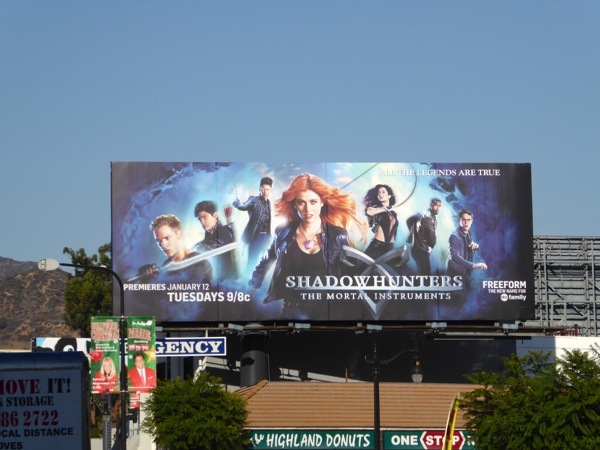 The young cast also stars Dominic Sherwood, Matthew Daddario, Glee's Harry Shum Jr., Emeraude Toubia, Isaiah Mustafa (from the Old Spice TV commercials) and Alberto Rosende. 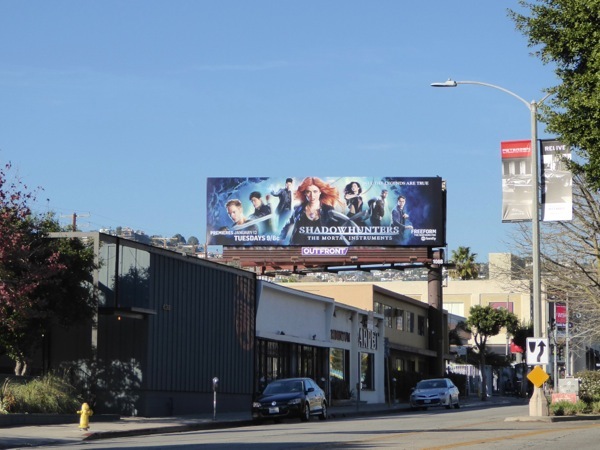 These launch billboards for the new TV series reboot were first spied along Fairfax Avenue on December 16, 2015, then snapped later along Highland Avenue and Melrose Avenue through January 8, 2015. 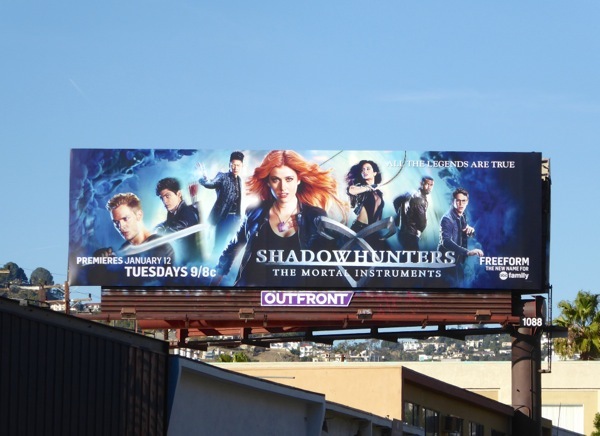 The key art for the Freeform's series is a real improvement over the dull and dated outdoor ad campaign for The Mortal Instruments: City of Bones movie from 2013. MTV also debuted its new fantasy series The Shannara Chronicles recently, so it'll be interesting if audiences have a craving for more (although fortunately both series come with their own existing built-in fan base).